Florida Keys Accommodations Guide Conch Republic Accommodations is committed to promoting tourism and quality lodging in The Florida Keys and Key West through videos shot in High Definition video and streaming live over the internet. In entertaining short video episodes, Conch Republic Accommodations shows you the latest and most exclusive accommodations that The Florida Keys and Key West have to offer, always free and on demand. Our online video tourist hosts take you behind the scenes for a travel look into The Conch Republic lifestyle and the people who define it. 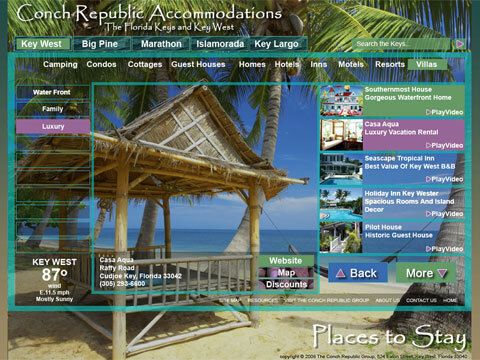 Don't forget to log in to www.ConchRepublicAccommodations.com every day and stay up-to-date on our most recent video segments. All travel programming is thoroughly scouted to guarantee that Conch Republic Accommodations brings you only the finest Florida Keys destinations, properties, services and trends. The Florida Keys and Key West, we're flip flop friendly!